As you can see I wasted little time in picking up another brew from Anchor Brewing. 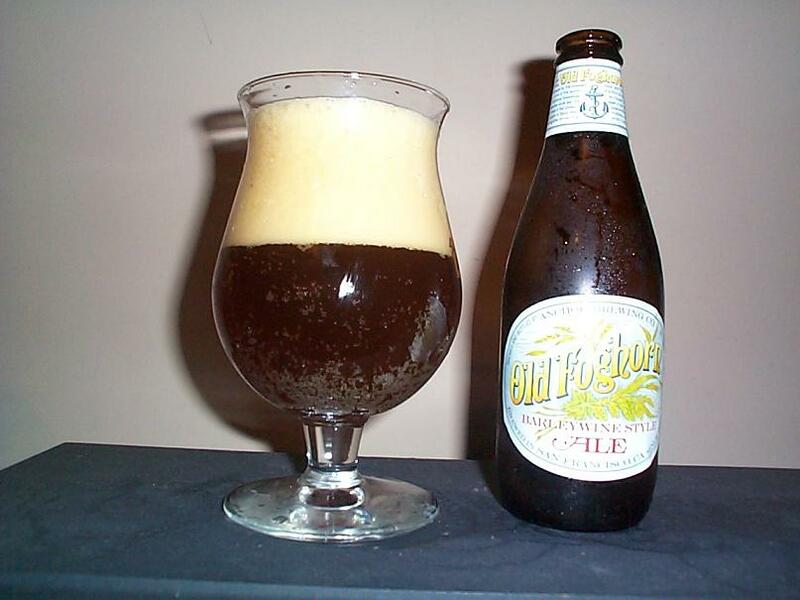 This time we have the Old Foghorn a barleywine style ale made in the English tradition. This beer pours a very nice deep dark red color. Head is plentiful, solid and relatively light in color. The aroma of this beer is lovely, strong sweet caramelized malt scents balanced with a slightly bitter smell of fermented fruit and alcohol. This beer has an intense flavor as any good barleywine should. Flavors of intense malt and hop bitterness countinue on to flavors of fermented fruit and sweet caramelized malt, finishes with a delightful dance between the sweet and bitter flavors. Mouthfeel is medium and the ABV of 9.4% is certainly noticeable in this beer but it is by no means unpleasant or predominate. The contrast of flavors make for a delightful sipping beer any time you want a quality strong drink. This is a very good beer, anyone who likes strong or complex beers will likely find this to be a good choice. Give it a shot and ride your bike.